When we first moved in I was blown away by the master bathroom – what with it being so spacious and luxurious and masterful and … I … can’t … keep this up. Eeeet's a joke. There’s nothing grand or masterful about it. It's really quite teensy – the wide-angle lens is doing it a lot of favors here. There's zero natural light, and the builders chose literally the cheapest light fixture they could find at Home Depot. The towel and toilet paper racks were also discount finds; they were installed so poorly that the towel bar would fall off whenever it had to bear the burden of a towel and the toilet paper holder would tip uneasily toward the floor, sending the TP roll tumbling like a ribbon dancer. (I replaced them immediately) We have a single vanity that's all sink no counter and the plumbing cuts into a lot of the storage space below. That's a big deal because we don't have a linen closet or medicine cabinet 'round these parts. But enough of my kvetching. 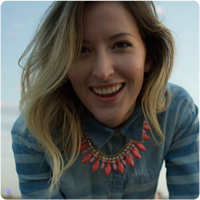 Let’s talk about the good: everything is new (!!! ), there’s running water, I can take a shower or a bath, the tile is a neutral color, it’s attached to our bedroom, there's an identical one a few feet away. Tons to be grateful for! For me, the mission in this bathroom is twofold: make the room feel bigger/brighter/more masterful AND find space to fit all my toiletries. So far I've only accomplished the latter. I may have told you at some point that I don’t like to have a lot of stuff because stuff takes up space. I probably neglected to mention my guilty exceptions – namely, toiletries (andclothesandshoes). I’ve been collecting all sorts of beauty products over the years and it’s hard to let go of them. How could I possibly choose between the sea salt hair spray for beach waves and the moroccan oil for silky straight locks? I simply can't! And so my beauty collection begins to spiral out of control. Some of you must experience the same thing, right? (Right???) Then there are super basic items – towels, wash cloths, toothpaste, hand soap, q-tips that also need a readily accessible home. Without a linen closet all these things start to feel really daunting, so here's how I handled them. 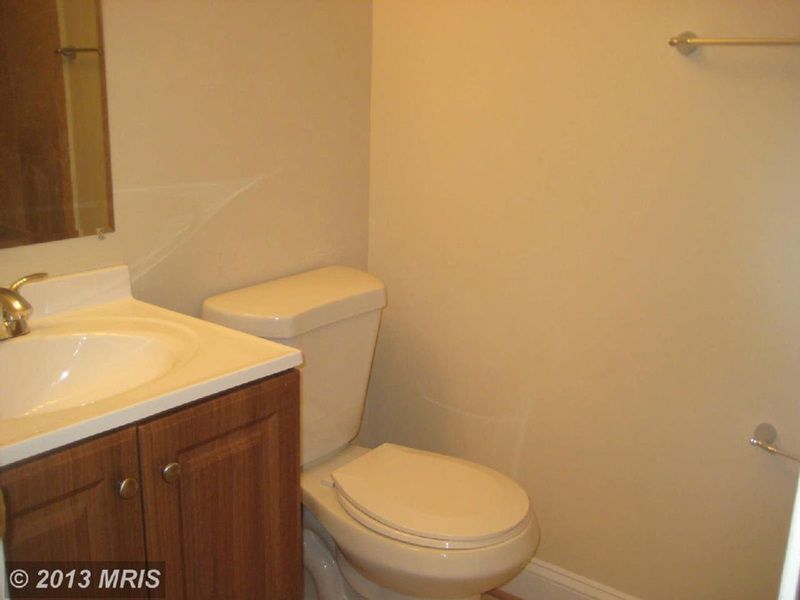 I wanted a light and airy bathroom that would feel spacious even if it isn't spacious. One good way to expand a room is by seriously limiting the number of colors that appear. If everything is similar in tone, lines start to blur and your eye can flow from one thing to the next without stopping, making it feel less crowded. The tiles selected by the builder were a warm sandy color – so if I was really following this rule I might have chosen a very light tan for the walls. Unfortunately in this scenario, I personally prefer cool tones (that skew blue – if you haven't noticed) over warm ones (that skew red...or tan), so I chose a light gray (Drizzle Sherwin Williams 6479) to play up the gray undertones I spied in some of the tiles. Our third color was set by the toilet, sink and tub – white. After I had my color trifecta – gray, white, and sand – I moved on to the actual problem: storage. I know, I know! I was just saying how I needed room in the bathroom for all my products. But then I thought about it – the reason I get ready in the bathroom (and thus store my stuff there) is because there's usually a bright light, a big mirror, and a counter to set my products on. This bathroom has pretty 'meh' lighting (though it looks positively blinding in these pictures...lies, all lies) plus there's no actual counter space around the sink, so things just get knocked over and next thing you know your favorite mascara is rocketing into the toilet. No bueno. So I said, "screw that!" and created a separate vanity (in a loose sense of the word) in the corner outside the bathroom. Seems like cheating, but if you have one square foot to spare somewhere, you could too. I went to Homegoods and picked up a tall, narrow cabinet and an interesting, equally narrow mirror to hang above it. Now it just needs a fun light fixture and it will be my jam. 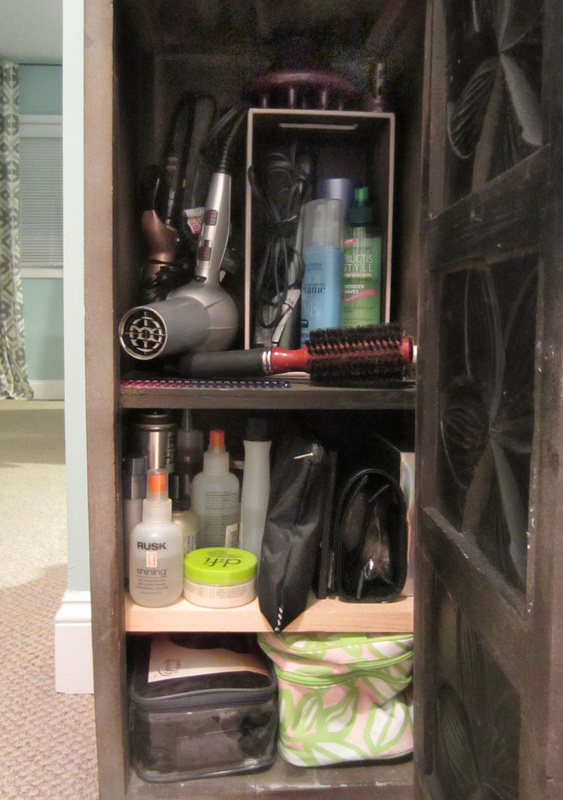 It feels great to have all my beauty supplies in one place, and it makes the bathroom storage conundrum way easier. With everything I hoped to store in the bathroom in front of me, I picked out the stuff I use everyday: hand soap, toothpaste, q-tips, face wash, lotion, contacts & glasses for my vision... These things need to be really easy to reach and they're generally small enough or come in enough colors that I can work them into the color scheme. Then there are a few things that I don't use every day but that happen to be the right color and visually very basic, e.g. white wash cloths, cotton balls, bath salt. I set those two collections aside as things that could live out in the open if I ran out of closed storage. Everything else is generally hideous and needs to be hidden in shame. Naturally. In every place before this one, I've played Jenga under the bathroom sink (wikipedia describes it as "a game of physical and mental skill" which sounds about right). I would just stack everything as high as I could, with one precarious stack leaning on another precarious stack, and if I ever needed to find something odds were 9 to 1 that it would all come tumbling down. I took a new approach this time and can't believe I waited so long. 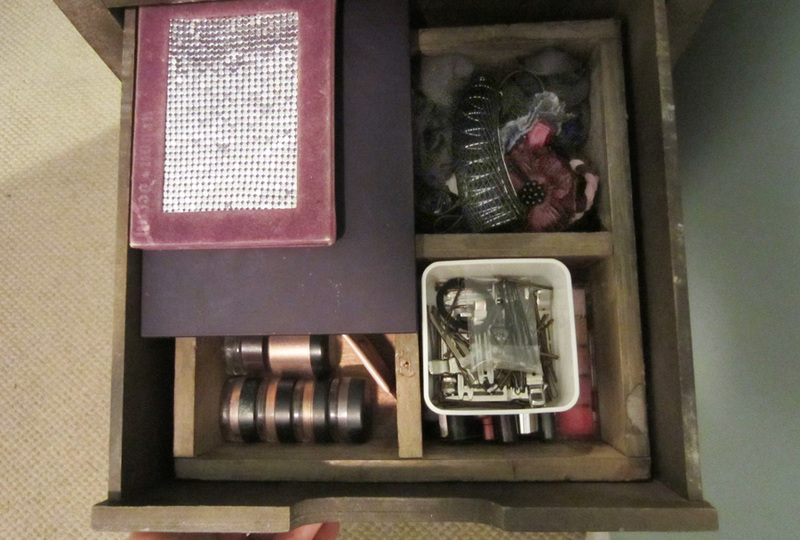 Compartments, guys – compartments! I picked up a few small wire baskets from Ikea and screwed them into the back of the cabinet doors to hold common (read: ugly) stuff. Now I don't have to go all crouching tiger hidden dragon to find the one small thing I need! I also picked up some drawers, baskets and trays that can be stacked and still easily accessed. The same principle is working for me in my new beauty corner, which sports small storage containers and a second shelf installed by moi to store more without slipping back into my old ways. You've heard this one from me before, but it holds true! The walls are your oyster. 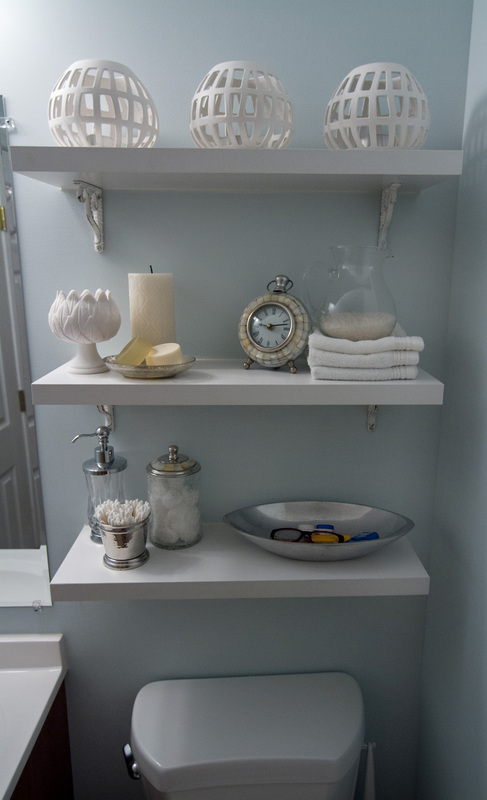 I miraculously fit almost everything in the cabinet with a lot of help from new compartments, so I turned my attention back to the things I previously set aside (contacts, q-tips, etc) I installed wall shelves and disguised my everyday things as decorative objects. Sneakay, sneakay. If I'm gonna have to look at the stuff on the shelves every day it sure as hayyyyyl better look pretty! I picked up some attractive containers from Homegoods (sticking to my strict color palette, of course) – a dispenser for hand soap, a cup for q-tips, a pitcher for bath salt... The white feather cup is hiding a few weeks' worth of contact packets but you would never know! I stole the oblong metal dish from another room to be a catch-all for glasses, lotion and a lighter for the candles. Yes, candles. Who doesn't want to feel like they're at the spa every day? The white candleholders on the top shelf were on clearance at CB2 for like $2 each, so I bought six. (I should have bought 10) And that pretty clock was another Homegoods find that is handy for telling me I'm running late to work (oops). These lil add-ons also keep the shelves from looking like a pantry. Do you really need 6 towels? Maybe you do. We don't. 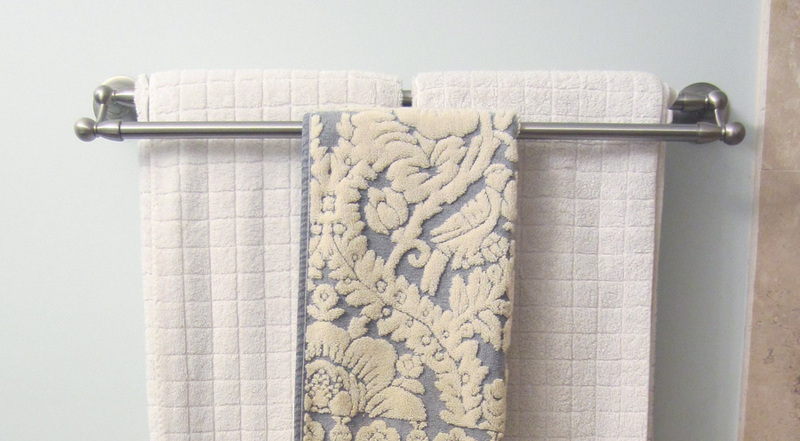 The master and guest baths each get 2 (+ a hand towel). I simply don't have space for loads of extra linens, guys! When the towels get dirty, I wash them! No biggie. If two ever becomes too few, I can rest easy knowing there's always the option of expanding onto the second bar of my new double-barred towel rack. 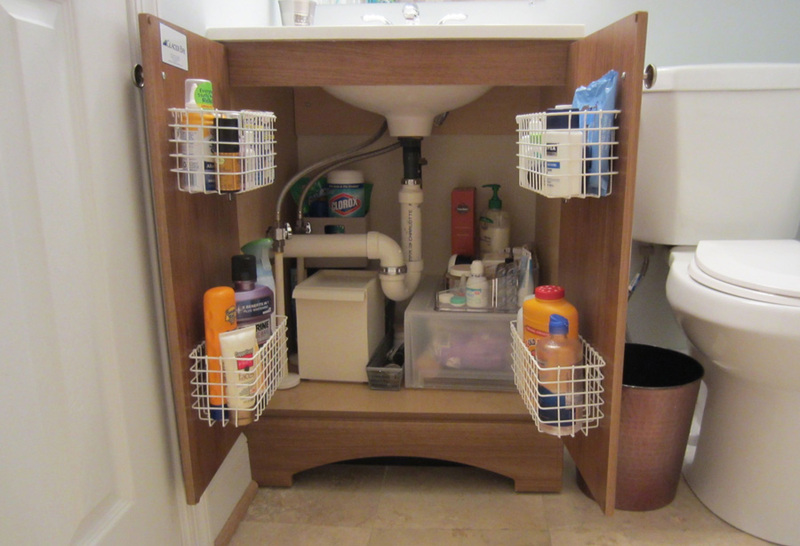 I left this tip for last because it's probably not an option for renters and because I haven't actually done it yet, BUT a medicine cabinet is a great way to create hidden storage and get small things off the counter. (I'm looking at you, toothbrush/toothpaste) I picked one up for $25 from a thrift shop in Alexandria, Va. called Second Look, but we haven't gotten around to installing it yet (you probably saw it in the laundry room pictures). We could mount it on the surface of the wall, but I'd prefer to have it inset. I'm still trying to convince Eli that it won't be all that difficult to do, but in the meantime it waits on top of the dryer. Future plans include a new light fixture and installing the medicine cabinet (obvi), painting the sink cabinet, swapping out the traditional door for a sliding barn door, and – if we can swing it – converting the tub/shower to a walk in shower with glass instead of a curtain. Might have to lose the bath salts if that happened. How do you guys feel about walk-in showers vs. shower/tubs?